Remember the Rocketts'? 60 or 70 person-dance company at radio city musical in NY? What made their magic was the fantastic teamwork and coordination of their dancing. Not one of them was a star. Each of them was superb. ​Restaurants in Hanoi are like the Rocketts. There are not any huge stars…just a huge network of extraordinarily gifted chefs working in restaurants throughout the city. Some were born here but most came for a visit ,made friends, acquires a family and just never left. Most cuisines are represented but the addition of Vietnamese taste in these flavours with many of the traditions of European cuisines is almost magical. Service is superb. Wine lists are generous and you set the pace of your meal. Let me mention some of the rockets who make Hanoi a great food city. Close to the Catheral or the Big Church as the locals call it , this restaurant offers a menu with spices reminiscent of An Nam (South of China). 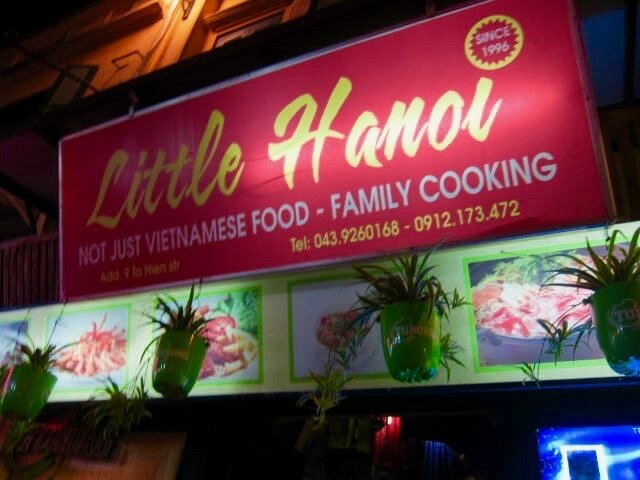 Once the protectorate of France, the name later was changed to Vietnam but the name suggests a blend of flavours that mix this Vietnamese heritage. Concocted by the famous French chef, Didier Corlou, the dishes are uniquely and beautifully spiced with traditional Vietnamese spices. Didier Corlou has other restaurants in the city worth going to: La Verticale specializing in French food, Madame Hien with traditional Vietnamese dishes from recipes of Didier's Vietnamese mother-in-law and DC Bistro. 18 Phan Boi Chau Str., OR 34 Phan Dinh Phung Str. You can sample Vietnamese street food and other traditional dishes in this open and spacious place organized into food stalls. You can watch the cooks prepare the food. We always order the seafood hot pot here and enjoy the banter with Ha, one of the fun servers. 61 Hang Gai Street, Hanoi. In the midst of Old Quarter shopping, often I come in Tan My and have tea in the restaurant there. It offers not only calm and serenity but also tasty food to replenish one's energy for another bout of shopping. 58-Ly Thuong Kiet, Hoan Kiem, Hanoi, Vietnam. Just a short walk around the corner from where we stay, San Ho has become our go to restaurant in Hanoi when we are in the mood to eat out. Housed in a beautiful old colonial home, it is inviting from the outside. The big draw for us, though, is the regular 7 p.m. musical performance using Vietnamese traditional instruments. It is uniquely different from the usual music we listen to, thus, its charm. The tiny expert hands of the Vietnamese musicians sometimes produce music of familiar songs such as Greensleeves or Guantanamera. This also makes us hum and sway to the delight of the servers. Food is excellent and expertly served by staff who seem to enjoy what they're doing. The last time we were there, we tasted different types of blue crabs. We had fun tasting each dish and savouring tamarind in one, garlic in the other at the same time guessing the other spices used. But the one special feature that joyfully surprised me was the heated toilet seat. Don't miss this one when you go to this restaurant. Our Favourite Pho Restaurant. Every weekend, breakfast is right here. At times, the line up is long but the wait is not. People get in here and immediately, your bowl of Pho comes especially when they already know the one you like. Cooking is right in the street and the spill over of Pho breakfast enthusiasts sit in low stools on the street. We have tried other Pho places but we think that the the soup base here is just full of flavour and beat all the others. 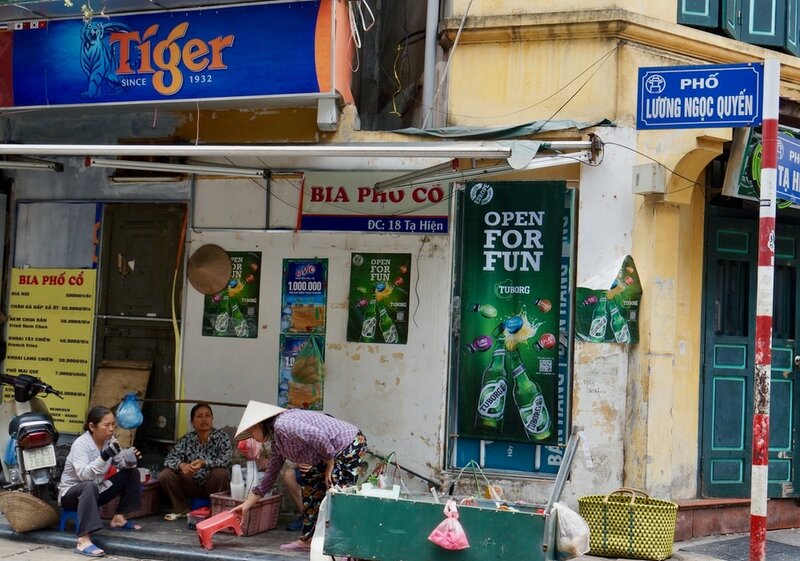 But on weekends, what's even more fun is this area of closed off streets around Ta Hien and MaMay. Restaurants and street stalls crowd the streets with musical bands, both traditional and modern, as well as other performances.